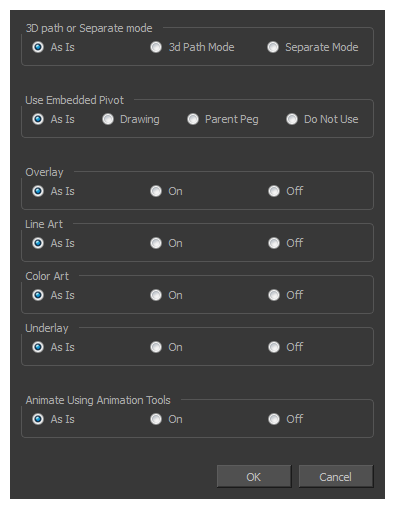 When working with several layers, you may frequently want to modify a series of settings. Instead of opening the properties for each individual layer, you can set the properties for many layers so you can change a common setting in a single click. NOTEYou can add the button to the Timeline View toolbar through the Toolbar Manager. In the Toolbar Manager, you will find the feature in the script section under the name Script: TB_Set_Properties_on_manu_layers in TB_Set_Properties_on_many_layers.js. In the Timeline view, select all the layers you want to modify at the same time. In the Timeline View toolbar, click the Set Properties for Many Layers button. This option is not available by default in the Timeline View toolbar. You must add it through the Customize option. right-click on the toolbar and select Customize. In the Available Tools list, select Script: TB_Set_Properties_on_many_layers and move it to the Toolbar list. The Set Properties for Many Layers dialog box opens. Modify the properties. If your nodes have different parameters enabled for a certain setting, leave the As Is option selected to avoid modifying it. Each node will keep its original setting. Select any other options for all nodes to change to this parameter regardless of their original setting.